August holidays are most popular for blissful beach and city breaks with couples, friends and family, with peak season promising sunshine in all your favourite destinations. School's soon to be out, and whether you fancy a short haul city stop exploring Paris, Budapest, Istanbul and Lisbon or want to fly further afield, we've got a chic selection of seven sun holidays in August that you can snap up today! Budapest is balmiest in August, making it a perfect time to soak up the atmosphere in cliffside ruin bars and relax in thermal spas. Once you've wandered the cool, cosmopolitan city and ticked off the key sights with the kids (Chain Bridge and Buda Castle are worth a visit), your next stop should be Palatinus, a popular open-air bath on Margit island near the Danube. Foodie's should hit the Central Market Hall where you can stock up on fresh fish, meats, fruit, cheese, pastries and more. If you're travelling solo or with your partner and like to party, lovers are in luck as it's carnival season during August, so a day at the world-famous Sziget festival is not to be missed! Prague's gorgeous gothic architecture dots the authentic cobbled streets, with bustling markets, buzzing beer halls and historical buildings to match. The 9th century Prague Castle is a must visit if you're into culture, along with the nearby Old Town that features a charming central square and a 600-year-old astronomical clock - a fun history lesson for the little ones. Prague may be landlocked, but it brings you the perfect beach on the bank of the Vltava River, where you can play beach volleyball, relax on a sunbed or float in a pool. Drop in at the nature reserve of Divoká Šárka, on the outskirts of Prague, where you can spend time with a picnic at the picturesque lake or go biking. Browse our Prague holiday deals. If you're looking for a lively beach and city break, Lisbon is a fantastic destination to visit in August. This coastal city has a variety of beautiful beaches to relax on, including Cascais-Estoril to the west, Costa da Caparica and the Serra de Sintra National Park. For sight-seekers, head to the gorgeous hilltop neighbourhood of Bairro Alto, where you'll find a selection of restaurants, cafes, bars and brilliant nightlife, or indulge in some retailtherapy at Avenida da Liberdade. Drive down to the resort town of Costa da Caparica, where the beach stretches 30km along the peninsula and is great for surfing. Browse our Lisbon holiday deals. Croatia's second largest city boasts golden sandy beaches, century-old sites and spectacular nightlife, making it a hot spot for both lively and laid-back holidays. With temperatures climbing to highs of 29°C, August is the an ideal time to explore Split's chic coastal city, whether you spend time lazing on the beach in popular spot Bacvice, exploring ancient-old architecture in the UNESCO-listed old town or hop on a boat and cruise along the Adriatic Coast, stopping by idyllic isles along the way. If you're into Game of Thrones, take the kids on a tour of the film set in Dubrovnik! Browse our Croatia holiday deals. If you fancy a buzzing city break with gorgeous beaches to match, Barcelona holidays are you're best bet. If you're travelling with the family, head to Parc de la Ciutadella, where you’ll find a waterfall, lake, zoo and playgrounds to enjoy. Explore the city's eclectic art scene in Park Guell, take the train to the popular town of Sitges or simply soak up the sun on a 7km stretch of sand at Barceloneta beach - the options are endless! Browse our Barcelona holiday deals. Florence is a fantastic city that's bursting with authentic Italian charm. Probably more popular with the parents, the colourful centre boasts chic boutiques, cultural buildings, an awe-inspiring art scene plus some of the most amazing food and wine in the world - it's easy to see the appeal. Once you've soaked up the city's rich history, head for the winding River Arno and cross the famed Ponte Vecchio bridge (lined with jewellery shops), or settle on the urban beach with a cocktail in hand. Want to explore a little further? Take a day trip to Venice and spend time cruising along the snaking canals. Browse our Florence holiday deals. 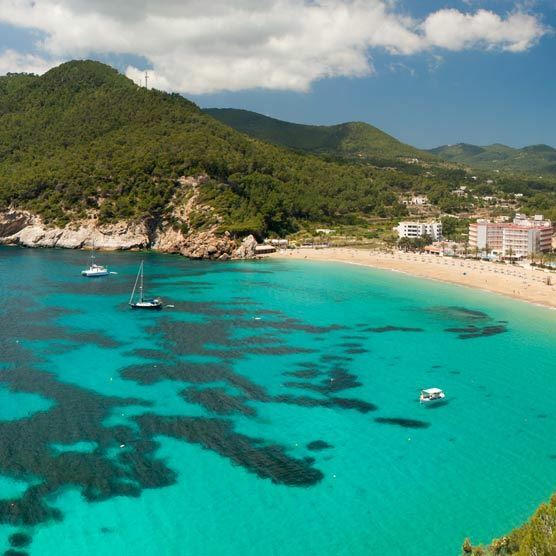 Ibiza effortlessly brings together a blend of party atmosphere, stunning beaches, lush pine forests, quiet coves and cobbled streets - with a gorgeous Mediterranean climate to match. The island is dotted with over 80 beaches, where the crystal-clear waters promise amazing watersports. If you're looking to slow the pace, go on a sunset cruise at San Antonio or Playa d’en Bossa and lie back on the soft sands of Cala Bassa - where you'll experience ultimate bliss. Browse our Ibiza holiday deals.